TBIRF has a rich history in providing education for physicians, other spine care providers, and researchers. Through a variety of lectures, case conferences, and journal club meetings, all aspects of spine care are addressed. Conference curriculum includes anatomy, physiology, biomechanics, microbiology, pathology, patient safety, patient evaluation, research, ethics, practice management, and other areas as they relate to spine. The cornerstone of these activities is the Neuroscience lecture series. 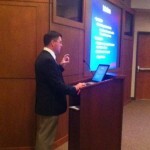 In 2012, TBIRF provided 1,025 hours of physician CME credits through various ongoing educational events. These CME credits are awarded through the joint sponsorship of the North American Spine Society (NASS) and the Texas Back Institute Research Foundation. NASS is accredited by the ACCME to provide continuing medical education for physicians. For information about our educational activities or to be put on the e-mailing list for these activities, please contact Amy Park at apark@texasback.com or 972-608-5148. Twice monthly on Friday mornings, TBIRF sponsors a one-hour CME accredited conference attended by 30-50 healthcare professionals, including surgeons, fellows, physiatrists, psychologists, physician assistants, nurses, therapists, researchers and others. The conference format is a lecture and interaction with the participants is encouraged. This conference is free of charge and all spine care providers are invited to attend. Please see the Calendar below for upcoming events. Weekly, either the Interesting Case conference or M&M is held to discuss challenging cases and/or complications arising from care. These conferences provide an excellent opportunity for Fellows and attending surgeons to interact and refine decision making skills related to the possible use of additional diagnostic evaluations including various injections, referral to a neurologists, referral for formal preoperative psychosocial screening, DEXA scans, or additional imaging studies. Through this interaction, Fellows are involved in the discussion of which additional evaluations, if any, may be helpful in developing the best treatment plan for an individual patient with a challenging spine problem. The goal of each Journal Club meeting is to encourage a critical evaluation of scientific literature. This activity provides physicians the opportunity to read and discuss original, published literature. Both classic papers and recent literature are used. The purpose of this meeting is to provide research information that has historically and recently guided the treatment of spine disorders or that will affect the future of spine care. Secondarily, critical analysis and thinking skills are developed enabling participants to understand the impact, if any, that results of various research studies could or should have on clinical practice. Fellows are taught to critically read a research article so they can appreciate the scientific validity of the authors’ findings. Approximately twice a month, a lecture series involving only the Fellows and one faculty is held. These meetings provide an opportunity for focused discussion on a broad array of topics ranging from many clinical issues to coding, physician-industry relationships, and marketing your future practice. 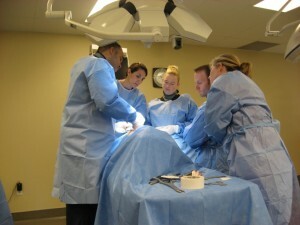 TBIRF has experience organizing a variety of other educational activities including lectures on new technologies, cadaveric training labs for surgical techniques, as well as courses designed for residents and fellows. One of the highlight events every year is the Fellow-to-Fellow lab where the graduating class serves as faculty for the incoming class. A Fellow teaches various suturing techniques to PAs and NPs. TBIRF and TBI have had the pleasure of hosting visitors from across the globe. The duration of the visits have been from days to one year for visiting fellows. Depending on their area of interest, visitors observe surgery and/or clinic, participate in the regularly scheduled educational activities, and possibly participate in research. Of course during their stay, visitors are encouraged to attend local activities such as sporting events including rodeo, attend the State Fair of Texas, and enjoy eating local favorites of barbecue and Mexican food.